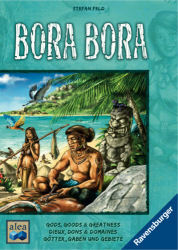 Bora Bora is a complex game for 2-4 players designed by Stefan Feld and published by Ravensburger (Alea). It is set on the Polynesian island of Bora Bora and players are trying to develop their society by exploring, building huts, fishing, collecting shells, praying in the temples and making offerings to the gods. It is typical of the designer as there are multiple strategies to explore and it is really just optimising how you gain the most victory points during the game. The box is really heavy as there are a lot of components. There is a main player board depicting the island and lagoon of Bora Bora as well as a number of separate areas for the various tile displays, status and scoring tracks. There are individual player boards, the right half of which is used to track progress in the various tasks you are trying to achieve; while the left half gives a useful reminder of a number of elements of gameplay. There are wooden pieces in each player colour as well as wooden resources for sand, stone and wood. There is a deck of 60 god cards in five different varieties that are used to help players in achieving their objectives. And then there are over 250 cardboard tiles and tokens representing the various currencies and objectives the players are trying to achieve. These are nice and thick and beautifully illustrated. Oh, and last but not least there are three dice in each of the four player colours. I’m not going to give a full run-down of the rules because it would take forever and I would point out that teaching these the first time is going to take quite a while – a full explanation could take twenty minutes or more – but that is because there is so much going on in the game. However, the gameplay is pretty straightforward once you understand the basics. You just have to appreciate that there are lots of options available to the players. The game runs over six rounds and each round has three main phases: a Dice Action phase; a Man/Woman Action phase and a Resolution phase. The Dice Action phase is the key part of a round and involves players allocating their three dice to a five types of actions. Firstly, you can expand and place a hut in a new area of Bora Bora. This can either be via land or sea and is limited by the number shown on the die allocated to this action. Expansion also yields a resource or an offering to the gods, plus an option to gather fish from the new area by using an appropriate offering/god card. Talking of which, a Helper action gives you, depending on the value of the die allocated to it, a choice of taking status points or shell tokens (from previously acquired Man/Woman tiles), victory points, offerings to the gods (which are the currency needed to play the sometimes vital God cards), resources (needed for constructing buildings), or clearing a hut from a space on your player board to enable you to recruit more Man/Woman tiles. Fourthly, you can place a priest in the Temple area of the main player board. A higher dice allocated to this action will mean the priest is more likely to remain in play for longer and priests give you points and God tokens in the third phase of each round. Finally, you can construct a building by surrendering the resources you have collected while expanding (the first dice action) and this will generate immediate victory points, with building in earlier rounds being rewarded by more points than building later on. And that’s just the first phase – don’t worry, the other two phases are more straightforward. However, the clever part of the first phase is the way in which dice are allocated. The first player to allocate a die to a particular type of action can choose any value of die. However, anyone who subsequently wants to use the same action can only do so by playing a lower value die than the last one played to that action type. This makes for some interesting decisions where by playing a lower valued die to an action, you can freeze an opponent out of using that action. In extremis, I should also mention that, if you do get completely stuffed and can’t use a die for one of the main actions, there is a consolation action that just gives you 2 victory points for each die not used – not an action to be used by choice really. Phase two of a round allows players who have collected Man/Woman tiles to use the actions of those tiles. Each round, a player can choose to use one Man action and one Woman action and these give a multitude of benefits – there are twelve different benefits depending on the tile acquired. Then the final phase, the Resolution phase, involves four things to be resolved. The Status track gives victory points for progress along that track during the round. The Temple track gives victory points for each priest in the temple and a God token (a wild God card) to the person with most priests in the temple. Each player has the chance to buy a Jewelry tile by spending shells and these give victory points at the end of the game. Then, finally, each player has the option of completing a task tile. Players have three task tiles allocated to them at random at the start of the game and should work towards completing them through the other achievements they fulfil during the game. Fulfilling a Task tile gives victory points and a new task is chosen so the players always have three tasks they are working on. After six rounds, there are some end-game bonuses and whoever has accumulated the most points is the winner. Phew! There is definitely a lot going on in this game and it is not one I would recommend for the typical family gamer. It is a serious game and players need to think about the plethora of choices that confront them and try and work out a strategy they think will work. Not that there is one obvious dominant strategy to my mind. To an extent, you are forced to work with what the dice rolls present you and where you are in turn order. Although going first gives you an advantage for choosing your first action, if people have played low dice before it gets round to your next turn, that’s going to make life difficult, although certain God cards can help. I’ve played the game with both two and four players and each worked very well. The Dice Actions available in the first phase are modified dependant on the number of players and this ensures that there is still enough tension in the two-player game although four-player leads to more crowding, particularly on the Temple track.